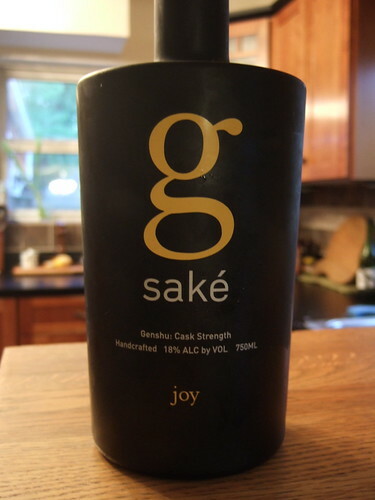 Photo: The G Sake, “Joy,” from Momokawa, the genshu junmai ginjo. I saved the last tasting for the big genshu. Genshu, basically undiluted sake, is different than “normal” sake (whatever that is) in that the brewer takes the ferment as far as possible without sacrificing quality. Then, the final result is not diluted with water to bring the alcohol level back down to about 16% (for example, G Sake is 18%). Genshus can reach up to 20% or so; before I opened this bottle I knew I was dealing with something that would hit me with a respectable wave of alcohol. What I didn’t know was how the balance would be struck between that higher level of alcohol and the flavors. I gave the G several tastings over a number of days because I knew it would change over a few days. Day 2: I was happy to find there was less cedar on the nose a day after opening the bottle. I don’t mind a bit of cedar, but it can interfere with getting at the sake itself. The nose carried more banana and the palate was creamier on the back with a better finish. Much better. Still, this is a bottle to open when you know you are eating hearty and spicy food. The following days the G mellowed out a little more, but basically retained the same qualities as on day 2. We tried it with a few different foods. It paired amazingly well with Korean spicy anchovies, Myulchi Bokkum. I know—thanks, Madam, for the overly specific food pairing. What I mean is this sake can stand up to to some serious heat and deep umami in the food and still come through as a distinctive pairing. That is how I would drink it in the future, with Korean food, with Thai coconut curries, and with American barbeque sauces. Hey, this is not a sake to sip gently while moon viewing, but I think it has a place as a foil for food. So, that’s it, my procrastination-laden series of tastings in SakéOne’s Momokawa and Organic product lines. I didn’t taste the nigoris, but considering how hard I am on even the best Japanese nigoris, I think I’ll hold off. Out of 5 sakes, all junmai ginjos, I found a huge variation in the brewing styles, which shows a very nice control of the process and interest in exploring the craft. Nothing I had was poor quality; if I dinged a sake, it wasn’t to my individual taste, but there was clearly something intentional being created. What would I drink again? Certainly the Momokawa Silver and Ruby were friendly drinking and were affordable enough for me to share with friends. The G is big and wouldn’t be something I’d relax with, but I can imagine enjoying it when I’m serving Sichuan, Korean, or spicy barbeque sauce. Obviously all the sakes I tasted were junmai ginjos. I have heard that U.S. laws require brewers to only brew junmai sake (so no alcohol can be added), but where is the daiginjo? Where is a hearty non-ginjo junmai? Thanks again to Dewey and SakéOne for the chance to taste these sakes and for responding to my posts. Dewey assures me that SakéOne continues to improve and change, so that my tastings this past spring may become obsolete. I will revisit these sakes to check in. Madam, well done! And thank you for taking on the challenge with a critical yet open mind and palate. You are very correct in noting that in the US we are not allowed to produce Honjozo style sake. The addition of spirits to sake is looked upon as adding spirits to beer which is not allowed. It is but one of many things that impact us due simply to the lack sake knowledge and understanding in the US. This is one reason we are thrilled to see people such as yourself sharing their knowledge. Information and tasting are key to advancing sake as a beverage in the States so please, keep up your efforts and we’ll keep working on brewing the finest sake in America. As for the hearty Junmai and a Daiginjo….keep watching us. You just never know what these American sake brewers will do. Kinda interesting explore if I can get American Sake in Japan. Nice photos and notes you got. Let me enjoy more stories to come. Sake forever! ようこそ! I’ll check with some friends in Japan if they have ever seen American sake in Japan. But of course, the Japanese sake industry really needs your support! Viva nihonshu!